The United National Party will take up the motion to form a national government at a parliamentary session later this month. Although the party was ready to debate the motion in the House today, the idea was abandoned at the last moment due to a procedural issue, party sources said. “Usually, when a motion is presented to the Speaker, we have to wait for five working days to debate it and hold a vote. If we want to pass a motion sooner than that, we have to suspend Standing Orders and go for a vote. We did not want to suspend Standing Orders and debate the motion on the national government today. We, therefore, decided to postpone the matter and debate the motion later according to Standing Orders. It will be taken up at a future session later this month,” Ports, Shipping and Southern Development Minister Sagala Ratnayaka said. However, Chief Government Whip Gayantha Karunathilaka yesterday sent letters to all ruling party MPs saying it was mandatory to vote in favour of the motion today. The decision to postpone a motion at a meeting chaired by Prime Minister Ranil Wickremesinghe last night. 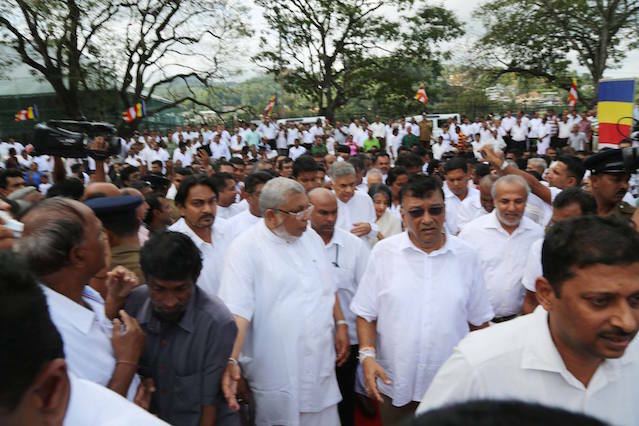 In his Independence Day speech earlier this week, President Maithripala Sirisena hit out at the UNP’s motion to form a national government saying it was an “unacceptable attempt”. “From what I saw in the media, there is a plan to form a national government with the support of a party that has only one seat in Parliament. It is important to think whether such an act is ethical,” Sirisena said, addressing the ceremony. Justice Priyantha Jayawardena Withdraws From Sarath Silva Contempt Of Court Case Citing "Personal Reasons"
Hearts know the gravity of being so unethical. There’s nothing called national governments unless there’s a mandate from people. This ts to include more crooks in the Cabinet and plunder the country. The delay is due to TNA’s negative response to RanilW. TNA’s majority is against the UNP’s plan and want to vote against it. RanilW is trying to use the so-called International pressure and Diaspora pressure to push TNA to support it or stay away from the Vote. This ‘procedural issue’ has been revealed by another MP of the Opposition! It depends on how the legislative rules are written. If one Party, 30 ministers allowed. If two parties, plural, more ministers allowed. Is there a minimum number of MPs required from the other part to form a National Govt. According to the current Constitution, a madman like you can be president. Let’s get rid of the madman electing executive presidency. Amarasiri – I agree, we should get rid of this excrement (Gamarala Sillysena) ASAP! It’s time people realize that the only interest SL politicians have is in the prosperity of their families, henchmen , and themselves. To achieve that end , they will stoop to any low level . The man who proposed the motion is a classic example. This is the cockamamie conundrum in Lankan politics ……….. the same Sirisena who tried to buy MPs for 500 million ……… is now barely a month later has the gall to stand up and talk about ethics! Ranil has not misappropriated a cent of the countries’ wealth for himself; he doesn’t have to ……. he is independently wealthy. But in all other ways Ranil is one of most dishonest politicians around today. It is said, “those whom the gods wish to destroy they first make mad.” This is true of the UNP/UNF. If they go through the process to form a National Government with another party which has only one MP, it may be legally correct, but it is certainly wrong and unethical morally. We have heard religious extremist groups committing mass suicide in the mistaken belief the world is coming to an end. Same goes to UNP/UNP. The party will commit mass suicide at the elections if they persist in their folly. I wonder who is giving such self-destructive advice to Ranil Wickremesinghe. Irrespective of the party, the common people are mad at Members of Parliament who openly demand ministerial portfolios and threaten they will jump ship if their demand is not. Ministership is the only way to make big money and to appoint their unqualified kith and kin to high profile posts. SSC educated Jalia Wickremesuriya, a cousin of former President Mahinda Rajapaksa, was appointed Consul General of the Democratic Socialist Republic of Sri Lanka in Los Angeles, California in 2005 and held the appointment till 2008. In August 2008, he was appointed by President Rajapaksa as Ambassador of the Democratic Socialist Republic of Sri Lanka to the United States and Mexico. During his tenure, he was investigated by the IRS on tax evasion and the US government requested the government of Sri Lanka recall Wickramasuirya. Now he is facing trial in a US court charged with multiple offences including money-laundering. The first Sri Lankan diplomat to face such ignominy in a US court. This is just one example. Ranil Wickremesinghe though he himself is honest is poor in judging people. Example, Arjun Mahendran. People learn from mistakes, but not politicians. The UNP/UNF politicians have not learned anything from history or forgotten anything from history. Any government completely DEVOID of each and everyone of this bunch of corrupt buffoons! They just cannot rule. Thats the long and the short of it. Sirisena, Ranil, MR and Bros and sons, Booroo, GLP, etc etc etc must be removed. This include, I am sorry even Dr. De Silva, Eran et al. ONLY Karu may remain. Hopefully, we will soon have an ALTOGETHER new name/s. “Mene, mene, Teke Upaharzin” Meaning, God has numbered your (government and finished it. You have been weighed in the balance and found wanting…….. It has been given to another. Leader of the Unpatriotic National Party Don Juan Wikkama-singham does not care for ethics. This could be his last chance to be the PM. So he is trying to hang on by hook or by crook. Silisena should take the full responsibility for bringing this guy to power and dragging this country down the drain. UNP MPs who are in the Parliament for the first time also want to hang on for the full period to get their pension. These BPs do not care for the country. My gosh, Eagle Eye, BP Mahindapalayo.. were you born yesterday ? BP Rajaakshes and olamottala SILLYSENA abused the office as no other leaders in the entire south asian region, not respecting the constitution, there your shut your both orifices and stayed as if you too were fed with kirimati (kirimati gilapu kimula waage), now you talk about the ethics ? We proved that you are an another ULTRA RACIST from the day one, your articles and whereabouts are known to us CT.
Why not you Mahinda Palayo, stay away, if you cant count 2 and 2 is 4 ?. Not Makandure Madhush, but you guys should be hung by your balls bringing to GALLE face green in order to start real peace and reconciliation in our home country. 3. In-born skills for frauds and cheating. 6. Tunnel vision about thinking about saving the power and party at the cost to the country as a nation. What a bunch of Kalakannis who can not think and feel suffering of ordinary people. National government is a waste of time and money. It only increases the number of minister and the number of ball carriers that come along with them. Dishes out authority without accountability to people who will not be hired even as peons in the private sector. We layLankans, find it difficult to afford the next family meal. Our leaders are not worried at all. They are interested only in their own survival. RW is no exception. Please note the last sentence in which MS sagaciously talks ethics!